Whether you are living gluten free--or you have friends or family eating a gluten free diet--you know that living gluten free may be challenging at times. When I think of Italian cooking--gluten free is not a term readily popping into my mind! I was excited to read and review the new Going Against the Grain Italian Style by Nuccia Ardagna. I am also excited to share the book tour giveaway at the end of this post where you may enter to win a copy of your own! What did I think of Ardagna's gluten free guide and Italian recipe book? Quick Summary of Going Against the Grain. This two-part book is a vital adjunct to any home attempting to be gluten-free. The first part guides you through early diagnosis and is an essential guide for any beginner diagnosed with celiac disease or some form of gluten sensitivity. You will learn how to identify symptoms of the disease, how celiac disease is diagnosed, and the consequences if left untreated. It will help you to understand how to read labels and how to manage your gluten-free home in a shared environment. It outlines practical advice for parents of children with celiac disease as well as tips for eating out and dealing with social settings such as special occasions or when traveling. Honorary foreword provided by renowned Dr. Peter HR Green, MD - Celiac Disease Center at Columbia University. 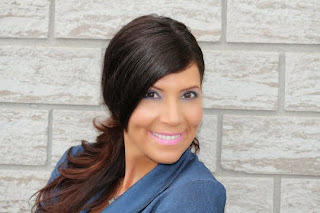 Growing up authentically Sicilian, Nuccia Ardagna thought that getting rid of gluten meant giving up her favorite traditional foods, but that could not be further from the truth! Nuccia combines her passion for eating amazingly Italian with her new dietary needs to bring you scrumptious, traditional Italian (and Sicilian) recipes. From simple, classic appetizers to decadent desserts you thought you could never enjoy, every recipe is easy-to-follow and offers beautiful full-color pictures throughout. You can feel confident about entertaining guests and family with these mouth-watering recipes. You can eat healthier, feel better, and truly enjoy living gluten-free while never having to sacrifice great taste! In this book, Nuccia not only shares her personal story with celiac disease but also the recipes she grew up with at home and uses to entertain guests. Look for the bonus section at the end of the book along with a section dedicated to her favorite links and resources. We hope you enjoy the book and find it helpful in your journey. Going Against the Grain Combines Both Gluten-Free Diet Knowledge and Creative Recipes. 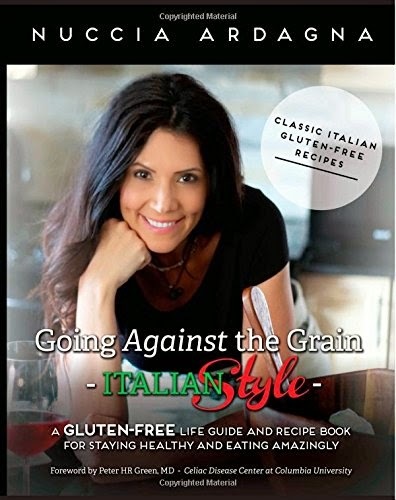 Ardagna devotes a large portion of the book to sharing information about living gluten free. She discusses her own celiac disease diagnosis and offers a number of tips for transitioning to a gluten free lifestyle in a gluten filled world. Her writing style is very open, honest, and conversational. She relates very well to readers facing a life changing, dietary change--and takes a lot of the fear and negativity out of the change. Italian comfort foods are a big part of many our diets and, with a few changes and substitutions, may still be enjoyed with a gluten free diet as well. Ardagna Combines Homemade with Semi Homemade Ingredients in her Recipes. Today, there are so many more gluten free options on our store shelves than in even the recent past. Ardagna combines the ease of gluten free pastas and breads along with traditional Italian ingredients. Every recipe in her book is gluten free--but, so loaded with flavor and creativity that the recipes are sure to be a hit. She illustrates that so many of our favorite Italian meals are just as delicious without the gluten! Would I recommend Going Against the Grain..Italian Style by Nuccia Ardagna? Transitioning to a gluten free lifestyle is intimidating at first--but, it doesn't need to be so daunting. Nuccia Ardagna shows that even a traditionally, gluten filled diet, such as her native Sicilian, may be successfully modified to fit gluten free needs. The recipes in this book are straightforward, use convenient, commercially prepared gluten free products when possible--and written in an easy to understand and easy to use format. If you enjoy Italian food--but, need to experience it from a gluten free perspective--this book is perfect for you. You will also find a number of Ardagna's favorite resources for celiac disease information and gluten-free products. Buy Going Against the Grain - Italian Style by Nuccia Ardagna. Nuccia Ardagna loves to travel to the place of her roots: SICILIA! Being Sicilian, she grew up with mamma, nonna and all her zie learning all the tricks of the trade and creating DELICIOUS Italian food from scratch. When diagnosed with celiac disease she was forced to learn new habits and, now, after trial and error and experimenting, wants to share her exquisite culinary creations with you. This post is part of a book tour with Italy Book Tours. Check out the other stops on the book tour for guest posts, additional reviews, author interviews and more! Thank you so much Angela for reading and reviewing my book! I appreciate your comments very much and if anyone has any questions please feel free to ask! I would love to be able to cook a good meal for my gluten-free friends. Right now, they usually just bring their own food. Yes it can be pretty daunting when you don't know the implications. If you ever have any questions feel free to reach out! :) I'm sure you can do it.